My eldest daughter and her husband have been singing with their kids forever. Okay, not literally forever, as her kids are not very old- 5, 4, 3, and 1. However, from the childrens' perspective it is forever, because she was singing hymns to them when they were still in the womb. I have a vivid memory of her singing to her firstborn while he was being resuscitated after being born gray, limp, and unresponsive. I am positive he stayed with us to hear more of his mother's songs. Very recently this busy family has been working specifically on the hymn Trust and Obey. This mainly means they make sure to sing it every day in a more focused, intentional way. I could tell Trust and Obey was their current hymn because while the grandchildren were visiting me recently, they gathered themselves and their baby cousins together on my stairs and sang most of the hymn together, and my grandma heart was warmed to the core. Imagine the joy of hearing your small grandchildren spontaneously singing hymns together just for fun, because they want to. A couple of days ago, the four year old unfortunately did not obey, and this resulted in an unplanned trip to the emergency room where she had to have a blood draw to determine just how dangerous her disobedience had been. To be honest, it was a pretty rough experience for them all, and perhaps especially for our small grand-daughter.. Her brother was born with a medical condition requiring regular blood draws, so she knows more about it than most four year old children. When she saw the white-coated staff coming toward her, she knew what to expect, and she was upset. Her mama offered to sing to her to help her think about something else, and asked what song she would like Mommy to sing. She was still thinking about what song she wanted when the process began. It wasn't their fault- the ER room was swamped, and other patients were waiting. The staff was as kind as possible, but they were forced to rush. They began with back to back. simultaneous and brutal sticks- again, not their fault. She is not an easy stick. It was at the moment this torture began that my grand-daughter blurted out her answer to her mama's question- she sobbed out "Trust & Obey!" as the hymn she needed her mommy to sing. Paul and Silas sang hymns in prison, and they were able to do that because they already knew hymns and were used to singing them. She was able to come up with that hymn when she needed it because she already knew it. It's a recent part of her family stock of songs. She endured while Mommy sang. But more was yet to come. They took the finished blood draws and dashed out of the room so they could quickly get it to the lab and move on to other patients. Not much later a nurse returned, saying, "Bad news. one of them clotted before they could analyze it. I'm afraid we need another draw." Can you imagine how my little grand-daughter must have felt when she heard this? What do you suppose she was thinking when someone else came in and chatted gently with her while looking for another vein to jab in this petite morsel of a four year old? Would you believe that she was thinking of another hymn to sing and even choosing the order (she is a bit of a control freak at times)? While the nurse was searching for her vein, my nervous and fearful grand-daughter asked her Mama, "Can you sing Jesus Loves me & Trust & Obey? Sing Jesus Loves Me until she puts the needle in and then sing Trust and Obey." She then started chatting with the nurse about this song her family listens to on the computer and then sing together at home, and how it goes... and she sang a good chunk of Trust and Obey on her own to the nurse. My daughter tells me the nurse listened for a while and then said, "I just think it's so special that you sing with them like this! There are many children, and adults, too, who might find deep comfort and sustenance in singing these old hymns in times of trial (or in expressing joy). But they cannot, because they have never learned these hymns. Some Christians don't really even see the point in learning hymns. It smacks of rote religion, I suppose, or perhaps it brings a faint whiff of fusty, musty, dead faith. I do not know why- I grew up in a family where a hymnal was a standard part of our 'things to do in the car' on trips and we sang hymns while doing dishes as naturally and easily as we argued over whose turn it was to do the dishes. It may be something 'not done' any more, but that doesn't mean it's outdated and old fashioned. It means we are cut off from our roots. Regular singing, both personal and congregational, of Psalms and hymns and spiritual songs has been part of the Christian tradition from the dawn of Christianity. It is the birthright of every child from a believing family. But we, like Esau, have squandered our heritage for a mess of pottage, very much like Esau, in fact. Esau didn't want to bother to prepare or fetch his own food, and we don't think we need to sing our own songs any longer. In fact, we think we can't because we don't sound like trained musicians and we don't have dub-step at home, so we might, at best, listen to somebody perform these songs once in a while. Listening to a performance may lift our spirits, but Christianity is not a spectator sport. It's personal. It's intimate. It's relationship. We think the hymns that sustained the believers who went before us are too hard, too old fashioned, out of date, irrelevant, especially to little children. My grand-daughter is, of course, quite advanced for her years. She is bright beyond her chronology. Nevertheless, she is still only four years old. She was near panic in a very frightening and painful situation, and yet, even in that traumatized state, she was encouraged, strengthened, and comforted by a hymn over 100 years old. In fact, it is the hymn that came to mind first for her. This happened because she knew the hymn, because her parents did not decide for her that she could not relate to it or understand it. In a CM education we build relationships, develop good habits and nurture affinities to complex ideas and practices such as singing hymns, personally engaging in observation for nature study, poetry, art, and great books. We do these things when the children are young so that these connections are already there for the children to draw on when they need them. While God can, of course, work miracles, most often, he works with us where we are. Just the right hymn coming to mind when and where we need it is more likely to happen when those hymns are already a natural, integrated, whole part of our lives. Please. Sing with your children. P.S. Grand-daughter's bloodwork all came back fine, and she left the ER saying to her mum, "I guess next time I should.... obey." Thank-you to my oldest daughter for many things- permission to share this story and edit your words for an AO publication and for being the mother you are to those precious children, and for choosing the good man you did to father those darlings. A big thank-you to all the mothers of my grandchildren, because you all sing hymns with your children regularly and you all have married good men, so a story like this could have come from any of you. Basically, I'm thinking latch-hook kit. Ah- see also here for more info. I offer the following information in the spirit of scholarship and understanding, because I totally groove on discovering this stuff. It really helps me flesh out what Mason meant, what her philosophy looked like in practice, when I find more specific and concrete examples like the information below. When I see exactly what she did, it helps me come to a better understanding of what we might do today to further the same goals. If it might be fun and enriching and delightful to reproduce the same crafts in your home, by all means, please do, and share. If, however, the reading of this post makes you beat your head against the wall while repeating a tired and harmful mantra about your own worthlessness as a CM mama, please, stop. I am not sharing this to burden anybody. Don't beat yourself up. "Handicrafts and Drills.––It is not possible to do more than mention two more important subjects––the Handicrafts and Drills––which should form a regular part of a child's daily life. For physical training nothing is so good as Ling's Swedish Drill, and a few of the early exercises are the reach of children under nine. Dancing, and the various musical drills, lend themselves to grace of movement, and give more pleasure, if less scientific training, to the little people. not be allowed; (d) and that, therefore, the children's work should be kept well within their compass." Attend to garden (Aunt Mai's Annual, 1894). Carton Work, by G. C. Hewitt (King & Sons, Halifax, 2s.) : make a pillar-box, a match-box, a pen-tray, and a vase. 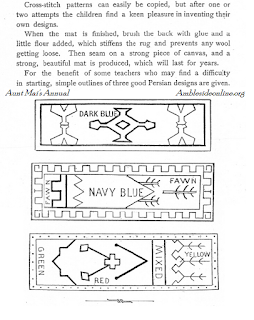 Smyrna rugs (see Aunt Mai's Annual, 1894). Children make their own designs. 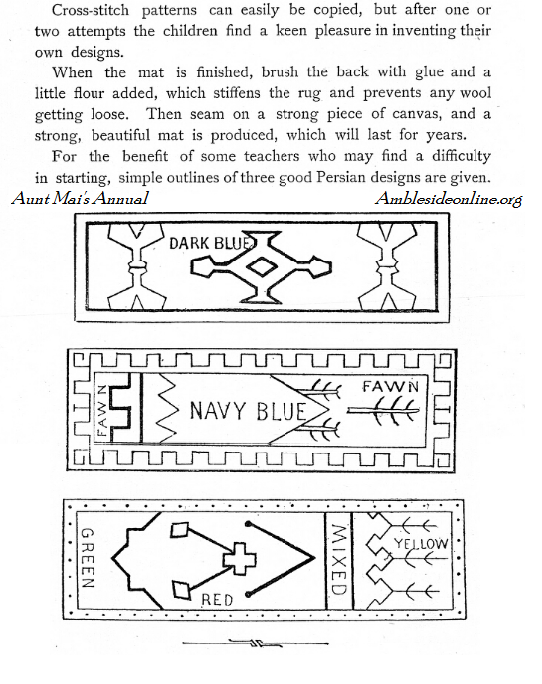 Self-Teaching Needlework Manual (Longmans, is.) : children to be exercised in stitches, pages 1-15. 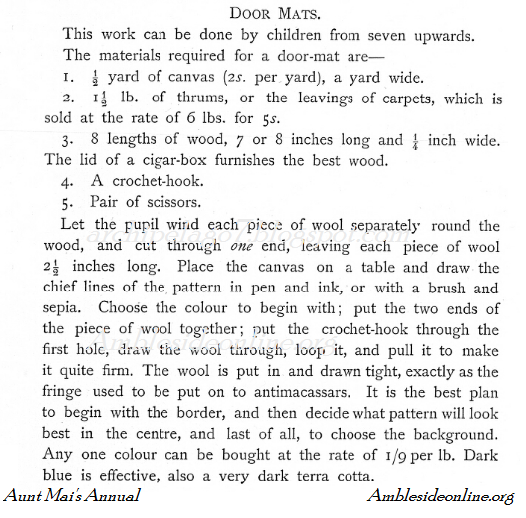 Use coarse canvas and wool ; then, coloured cotton and coarse linen." 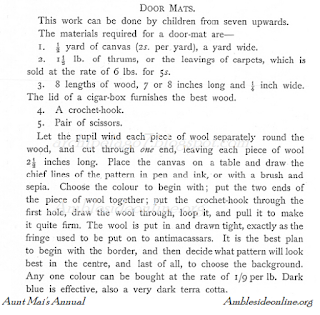 Here is the pertinent section from Aunt Mai's Annual, 1894, which I was thrilled to discover online (it's lovely!). THE educational advantages of this work are many ; it teaches carefulness, numeration, colour and design. 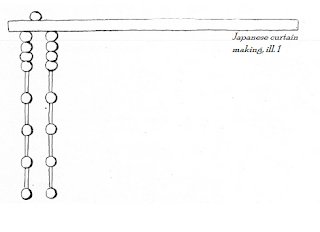 Carefulness, in pushing the string through the bamboo ; numeration, in getting the right number on each string ; colour, in choosing the coloured reeds and beads ; and design, whether the alternate lines should be the same colour, or two and two, or two and three, etc. 1. Bamboos or reeds, 2/9 per 100. 2. Beads, 10d. per 500. 3. A ball of string, 6d. 4. 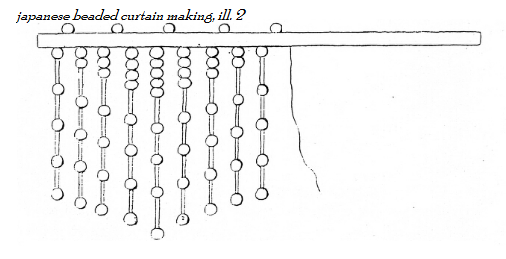 A bar of wood for each curtain. The bamboos are supplied in bundles of 1000 tubes, and can be had in white, red, purple, green, yellow, etc. They are each three and a half inches long, and are hollow, so that the string easily slips through. The round beads are the best for the nursery, and can also be had in many colours. A little four-year-old is very busy at present making a short curtain for the studio window, of cut green and yellow reeds, and bright yellow beads, and the effect is charming. The bar of wood can be made by any local joiner for a few pence. This must be three-quarters of an inch broad and thick ; the length must vary according to the width of your windows. Holes must be bored through at regular intervals of half an inch, one from the other, and he had better stain it brown or black before the children begin to work. The following lengths are those we have found to be most useful ; but each mother can measure and decide for herself whether the curtains must be longer or shorter. 1. Cut the string into lengths of forty inches. 2. Thread a bead on to each piece of string, hold the bead in the middle, and tie once. This prevents the little fingers pulling the string out of its hole. To vary this, you can again place a bead on each side of the tied one. 3. Push one end of the string through the first hole in the rod, and the other through the second hole, leaving the bead or beads or. the top. 4. 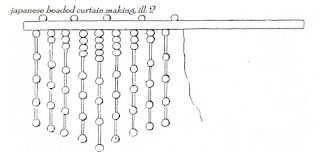 Thread four beads on the first string. This makes an effective border. 5. Thread one reed, one bead, one reed and so on, until four reeds are on. Then put a bead on and tie. The first row might be green. 6. Work the second row in the same way, substituting yellow reeds for the green ones. 7. Take another piece of string and thread one end through the third hole, and so on. 2nd row; 2 beads, the rest in the same order—green, yellow ; green, yellow. 3rd row; 3 beads; &c.
4th row; 4 beads, &c.
5th row; 5 beads, &c.
6th row ; 4 beads, &c.
7th row; 3 beads, and so on, until the child comes again to one bead, when she again begins the next row with two. " What can we take from this? 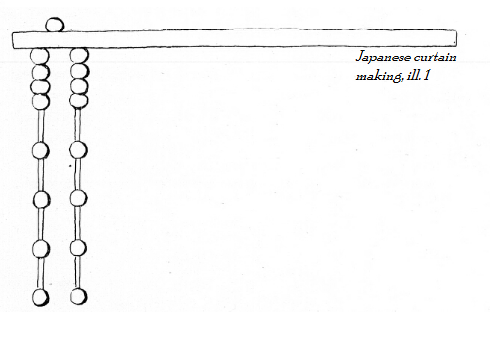 Breaking this down, it's essentially stringing beads and rods in a pattern, right? Not just randomly, but for a specific project of some use. But you could begin with a tin of beads and some string- a shoelace, perhaps. Our disabled child used to 'string' beads on a pipe cleaner, which I had anchored a bead at the end so she could not pull it off. A pipe cleaner was easier for her to handle. When she had a pipecleaner of beads, I would bend it into a shape- a circle, a heart, a star. one of my favourite Christmas ornaments is a bell shaped from a pipecleaner of beads she worked. Our beads came from thrift shop finds- they used to be popular in macrame projects. You could duplicate the window curtain, or make a door curtain as a family project- if you have a place where you could keep the project out for a while, safe from babies, each family member could work on their own string, or everybody could add whatever, as they have time. You could make jewelry, elastic string and beads are fairly inexpensive (when we orphan-hosted, we made our four boys bracelets with our phone numbers on them using number beads, interspersed by coloured beads). Youtube videos explaining how to tie these off abound. You could make key chains or Christmas ornaments or cell phone charms or something to hang from a car rear view mirror. Mainly, you want a project involving stringing beads in a simple pattern of the child's design, the more useful the better, keeping in mind that a beaded window curtain is our standard for useful here. IOW, don't overthink the useful aspect. Supplies are far more readily available to us than they were to mothers in CM's time, and not much more expensive in terms of real dollars. Amazon has wooden cylinder beads, dark or light , round and oval beads of coloured wood, holes large and small (so does ebay, in an impossible variety of colours, shapes, sizes, in wood, plastic, glass and stone or clay). You could use hemp cord or cotton embroidery thread. You could even resort to macaroni. Dye it by shaking in a bag with a few drops of rubbing alcohol and food coloring, spreading to dry on waxed paper. I prefer more permanent supplies, and don't recommend macaroni jewelry. But for early practice in stringing colored beads in a pattern, this may be an economical alternative. I have a cupboard over my bathroom sink which is missing a door. I am thinking a beading project to hang over a shelf or small cupboard indoors might be a useful way to display a child's beading craft while improving the appearance of a messy shelf or a bathroom cupboard missing a door. Up next, the smyrna rug. Our final plenary talk is available for download now, and it's called (fittingly) "The Heart of AO," by Lynn Bruce. "What makes one curriculum work for so many people, in diverse circumstances, all around the world? In her soul-stirring keynote address, Advisory member Lynn Bruce shares illuminating observations and testimony from fifteen years in the heart of AO. Spoiler: There is a hidden treasure inside AO, and some day it just might save your life." The audio file is 99 cents (U.S.) today (Friday) and Saturday; then it will be U.S.$5. Here is the link to order your download. The other four plenary talks are available at that link as well.